4 Gluten-Free and Flavor-Full Recipes! 2. In a bowl, combine Feta, green onions, dill and garlic. Add zucchini and eggs and mix well. Sprinkle sorghum flour, cornstarch and baking powder evenly over mixture and toss well. 3. In a large heavy skillet, heat oil over medium-high heat. Scoop out about 1 heaping tbsp. of mixture at a time and drop into hot oil. Repeat until pan is full, leaving about 2 inches between fritters. Cook, turning once, until nicely golden, about 5 minutes per batch. Drain on paper towel–lined platter and keep warm in preheated oven while you complete the frying. Serve warm. For ease of preparation use your food processor fitted with the shredding blade to shred the zucchini. Makes about 2 dozen. I love the unusual combination of flavors in this one-dish meal. It's easy enough to make for a weeknight dinner and particularly colorful if made with red quinoa. 1. In a blender, combine stock, coconut milk, and peanuts. Process until smooth. Set aside.2. In a skillet, heat oil over medium-high heat for 30 seconds. Add pork, in batches if necessary, and cook until lightly browned, about 1 minute per side. Transfer to a plate and set aside.3. Add leeks to pan and cook, stirring, until softened, about 5 minutes. Add garlic, Chile pepper, cumin, salt and black pepper to taste, and cook, stirring, for 1 minute. Add tomatoes with juice and reserved peanut mixture and bring to a boil. 4. Stir in quinoa and green beans and return to a boil. Reduce heat to low. Stir in pork and any accumulated juices. Cover and simmer until quinoa is tender, about 20 minutes. 3. Cut into 1-inch squares and using an inverted spatula remove from pan. 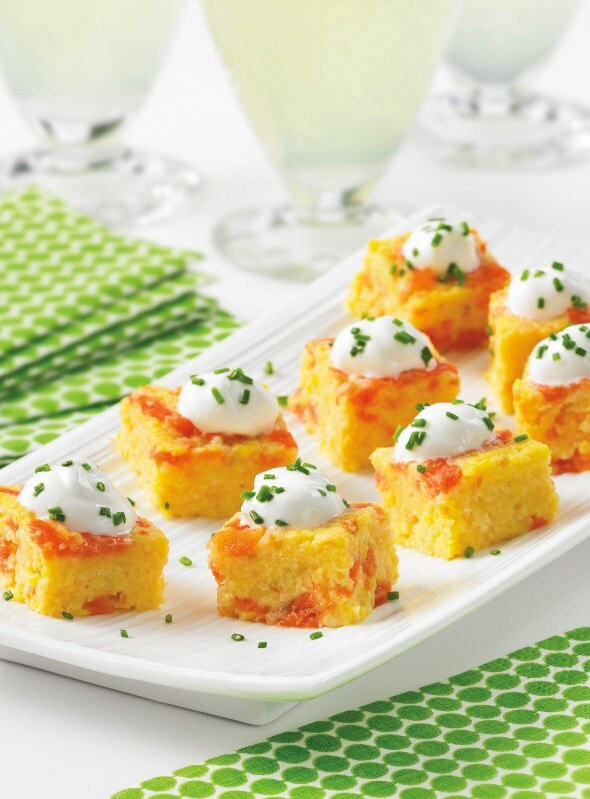 Serve at room temperature, topped with a small dollop of sour cream and garnished with chives. Tips: If you don’t want to stir your grits frequently, use a nonstick saucepan. An occasional stir will be fine so long as the heat is low. If you can’t find stone-ground grits, use coarse-stone ground cornmeal. Do not use the finely ground grits that come in boxes. They are not whole grain. Always check dairy products such as whipping cream and sour cream to make sure they are gluten-free. Tip: These cookies are a bit soft when they come out of the oven, but they firm up while cooling. Make sure they are just golden while baking — they continue to cook on the sheet after removal from the oven. 2. In a separate bowl, beat butter and sugar until light and creamy. Add eggs, vanilla and honey, beating and scraping down the sides of the bowl until blended. Gradually add flour mixture, beating until smooth. Stir in oats, coconut, cranberries and pecans. 3. Drop dough by tablespoonfuls, about 2 inches apart, on prepared baking sheet. Bake in preheated oven until tops begin to brown, about 12 minutes. Let cool for 5 minutes on sheets, then transfer to a wire rack and let cool completely. 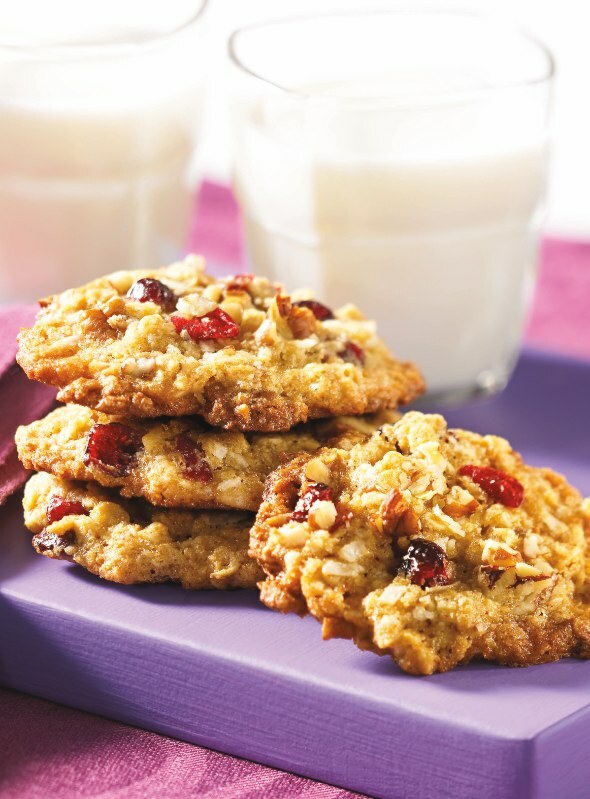 If you don’t like nuts, eliminate the pecans and double the quantity of cranberries. Similarly, if you don’t like cranberries, leave them out and double the amount of pecans.